The Lazzara 110' made its debut at the recent Monaco Yacht Show where it was complimented for its elegance, the result of a clever mix of intersecting soft lines that produce a classic design. While being a mass produced yacht, the Lazzara 110' offers external and internal finishing touches worthy of a custom built yacht and technical solutions that are uncommon on a product of this category. The stern platform, for example, can be rearranged to host difficult fishing trips and is therefore fitted with tanks for bait and catch, battle seat and numerous rod holders. Furthermore, in this configuration, the stern platform is more like a fisherman's cockpit than a beach at sea as it has been built with typical perimeter topsides. The American motor-yacht has three and a half bridges with the lower one entirely set aside for sleeping areas. There are two distinct areas on this deck, separate from the engine room. The one at bow is for the owner and his guests with a full beam suite at the centre of the boat for the former, complete with rest area, study area, wardrobe and bathroom with two toilets, shower cabin and Jacuzzi and three twin cabins, two of which double for the guests. The crew quarters offer three cabins with bathroom, one of them reserved for the captain. The areas dedicated to a variety of activities stretch along the main deck. Starting from the bow we have a spacious galley with dining area for the crew, box room with daytime bathroom, dining area for the owner and his guests and a large lounge with rest area, multimedia unit and games table. Outside, the main deck offers the perfect al fresco dining area in the cockpit or for chatting, together with a bar with counter and seating. In the standard version, you can reach the fairly large garage that can hold a ski jet, from the stern platform. The upper middle deck functions as a pilot house with full beam wheelhouse complete with double ergonomic seating for the captain and vice captain, as well as an "L" shaped sofa with table. Heading towards the stern you can access the open flying bridge by going up a few steps where there is another wheelhouse, bar with counter and seating, sunbathing area and double dinette with central Jacuzzi. There is a specific area for placing the tender on the fly stern extension, that can be moved using a mini crane. For further information: Lazzara Yacht Corporation; 5300 W. Tyson Avenue; Tampa; Florida 33611-3226; tel. 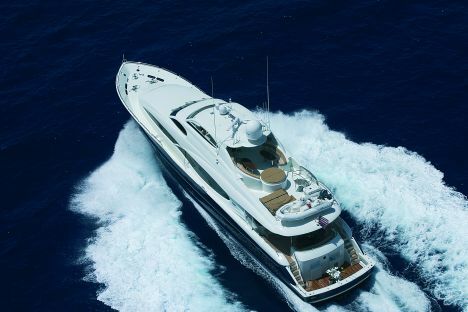 (813) 835 5300; fax (813) 835 0964; web site www.lazzarayachts.com. R.I.Na Certification: 100 A-1.1 "Y" Cat. 2-Yacht CCL Charter Class (MCA compliance).